Photographs copyright Andy Murch. All rights reserved. Common Names: Gulf of Mexico smoothhound shark, gulf smoothound, gulf smooth dogfish, sand shark, mud shark, smooth dog, smooth hound, grayfish. Long slender body. Dorsum plain grey/brown. Ventrum pale/white. First dorsal large and rounded. Fins have a pale to white trailing margin probably fading towards adulthood. Caudal fin deeply notched. Flat, plate like teeth. Interdorsal ridge present. Iris golden. Pupil large and rounded. Upper labial furrows much longer than lower. Pavement of high crowned teeth. Maximum recorded size 140cm. Size at birth 39 - 43cm. Continental shelf from 36m to 229 m. Mostly between 42 and 91 meters. Restricted to the Gulf of Mexico. Mostly along the northern rim of the continental shelf. The northern population may extend down the western edge of the gulf and link up with a second smaller group located in the southern gulf west of the Yucatan. Diet consists of crustaceans, molluscs and small fishes - menhaden among others. Viviparous with yolk sac placenta. Recorded litter size 8. Not evaluated. It's limited range probably makes it susceptible to over fishing. Gulf of Mexico under an oil rig. Sympatric species include the Florida smoothhound M.norrisi (described as having upper labial furrows shorter than lower). M.norissi may be synonymous with M.canis (also sympatric) which has upper labial furrows longer than lower but to a lesser degree than M.sinusmexicanus. Not known but probably shy like other smoothhounds due to small size. Although this species of smoothhound shark can be found within recreational limits, encounters with divers have not been recorded. 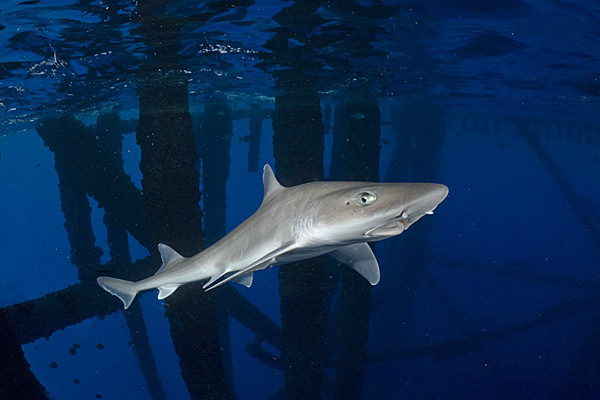 It may be possible to encounter the Gulf smoothhound while diving under some of the deeper rigs that are sprinkled along the continental shelf in the northern Gulf of Mexico. Reports of sightings/encounters would be welcome. Sharks of the World. Leonard Compagno.